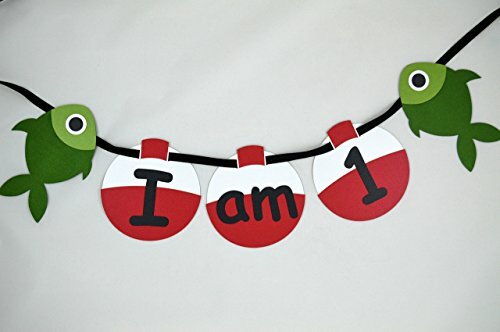 This fishing theme I am 1 high chair banner is laser cut from heavy duty card stock. Each fishing bobber is about 4.5" and the fish measure 4" wide by 5.5" long. The banner is strung together with black grosgrain ribbon. The banner measures about 22" long pulled straight and has 18" of extra ribbon on either side to allow for hanging.